Circuit Clerk Phyllis Stanford gathering in the vote on Saturday Nov. 24th. Absentee voting for the Tuesday’s special runoff election for a U. S. Senate seat has been heavy in Union County and throughout the state. Although the governor had authorized a four-day Thanksgiving weekend for state workers, the office of Union County Circuit Clerk Phyllis Stanford and those of circuit clerks in all 82 Mississippi counties were open until noon Saturday for absentee voting. Circuit Clerk Stanford said her office had, so far, received 274 absentee ballots. That is considered a high number of an election with only two contests on the ballot. 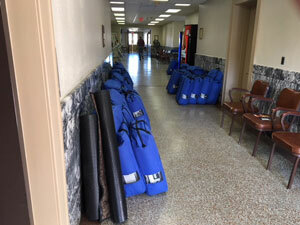 There were no voters still waiting to vote when the doors of the Union County Courthouse were locked at noon. Union Countians have voted absentee in large numbers for the runoff election. 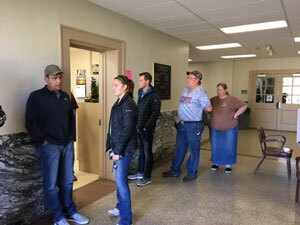 However, in Jackson, when the doors were locked at noon, many voters were already lined up inside, waiting to vote at the office of the Hinds County circuit clerk. It was estimated that it would take three hours to accommodate all the Hinds County absentee voters already inside. Because of poor health, Senator Thad Cochran resigned in April from the senate seat he held for 40 years. Republican Mississippi Governor Phil Bryant appointed Republican Mississippi Agriculture Commissioner, Cindy Hyde-Smith, as Cochran’s temporary replacement. Four candidates entered the non-partisan “jungle primary” election to serve the last two years of the senate term to which Cochran was elected in 2014. Republican Hyde-Smith and former U.S. Secretary of Agriculture Mike Espy, a Democrat, both received about 40 percent of the statewide vote in the first election on Nov. 7th, eliminating two of the four candidates. Mississippi law requires a majority in such contests, so Hyde-Smith and Espy will face off in the Tuesday, Nov. 27, runoff. Although it is a non-partisan election and no party affiliation will appear on the ballot, it has been a heated runoff contest, characterized by millions of dollars worth of negative advertising, most of it financed by out-of-state sources, and by sharp Republican vs. Democrat partisanship. In the first election on November 7, Hyde-Smith received 4,702 (56.96%) of the Union County vote, Espy received 1,455 (17.63%), and State Senator Chris McDaniel got 2,027 (24.55%). However, McDaniel did not do nearly as well statewide and was eliminated from the run-off. Courthouse halls will be busy with election business on Tuesday, November 27. On Union County ballots there will a be a second non-partisan run-off election for one of the judgeships in Chancery Court District One. Those who will be in the chancery run-off are Lisa Ann Koon (2,255 Union County votes on Nov. 7) and Brad Tennison ((2,169 Union County votes on Nov. 7). Most Mississippi counties will have only the senate contest on Tuesday’s ballot. Voting in all 20 Union County precincts will start at 7 a.m. Tuesday, and polls will close at 7 p.m.